Enjoy the comfort of a yoga practice perfectly created to accommodate your needs at any given time. Increase the benefits that yoga can bring, helping you live a more balanced life, decreasing stress levels, improving sleep patterns and helping to soothe back pain (often caused by poor posture). We are one of the very few yoga studios in the North to offer Yoga Slings. 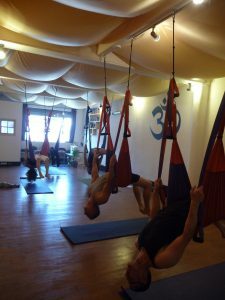 Yoga Slings can be booked for One to One session or small group (maximum 5 people) – a fun way to get many of the benefits from inverted postures like improved circulation, better organ function, healthier back and improved concentration. Also an excellent way to improve core stability and overall strength. If it’s your busy schedule that doesn’t seem to give you time to join a public class, or a particular condition where you prefer to have your own expert teacher following you closely, Andrew and Francesca are happy to discuss your specific needs and can create a practice that suits you. Whether it is a relaxing, a therapeutic or a strengthening yoga practice to accompany your sport’s discipline, we are fully qualified and insured, happy to arrange a time that suits you either in our comfortable studio (where all the props are provided) or in the comfort of your own home. We cater for small groups too – inquiries are welcome! Contact us today to arrange a one to one. Gift vouchers can also be purchased to give family and friends the gift of yoga.